This years line-up will have space for 39 bands. That’s three more than last year! That also means we still have a whole bunch of names to announce and so we will get on with it and add another five bands coming from all over the world to spend some excellent time in Belgium. By the way, did you know two of these bands are located 16.390 km away from each other and will travel 11.852 km from Santiago de Chile and 10.584 km from Singapore to perform at dunk!festival 2019! Bossk (UK) might not be unknown to you. These guys from Kent played Arctangent last summer and are confirmed for Roadburn Festival in April 2019. Knowing this we probably don’t have to add that it might get loud and heavy when they climb onto our stage to close The Forest on day one. Jozef Van Wissem (NL) released his latest album We Adore You, You Have No Name last month but it was a few weeks before when watching Jim Jarmush’ Only Lovers Left Alive that we were already reminded of this talented lute playing musician. Back in 2013 he even received a Sountrack Award in Cannes for his compositions for this unusual vampire story. This promises to be a perfect match with our Forest Stage. Paint The Sky Red (SG) will be the first band from Singapore to perform at dunk!festival and lists influences such as This Will Destroy You, Mogwai, Explosions In The Sky, Mono, EF and other greatness of the post-rock scene. This calls for a spot on the main stage! Their tunes were written to serve as a soundtrack for self-reflection and find meaning in difficult times. Make sure to grab a drink* before you go. Malämmar (ES) has played the festival before in 2017 and clearly proved their added value to the line-up back then. It’s only three of them but they are loud, full of energy and always thirsty. They got signed to dunk!records in 2016 with their album Vendetta and just released Mil Mentiras as digital EP which will also be available on vinyl through dunk!records later on. This will definitely wake up The Forest! 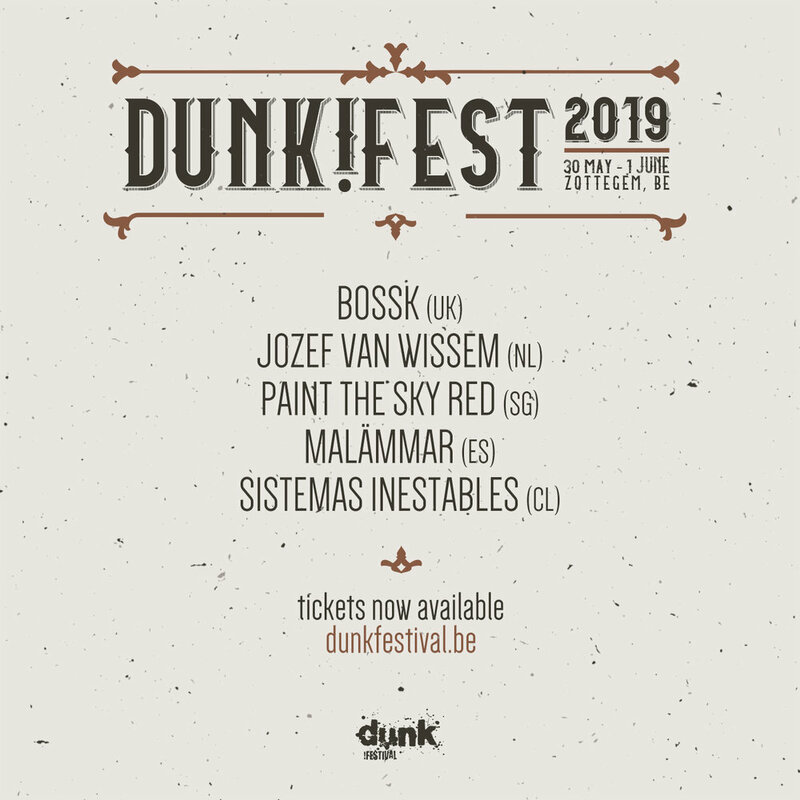 Sistemas Inestables (CL) released a brand new album a few weeks ago and will bring their refreshing sound all the way to dunk!festival 2019. There are a lot of great things happening in Chile and it became a tradition for our friends at LeRockPsicophonique to send over the best of Chilean post-rock. They gave us hidden treasures before such as Baikonur, Tortuganonima, La Ciencia Simple,… and we are excited to experience the electronic jazzy post-rock of Sistemas Inestables on our main stage.